Yogic Secrets of the Dark Goddess: Lightning Dance of the Supreme Shakti | Author: Shambhavi Chopra | Foreword by David Frawley & Note by Lokesh Chandra | Publisher: Wisdom Tree Books India | Pages: 300 | Type: paperback | Available through Amazon.com and through New Leaf distributors. 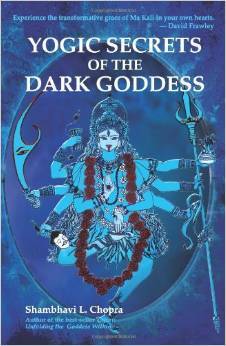 Perhaps the most important new book on the Goddess Kali to come out in recent decades,Yogic Secrets of the Dark Goddess unfolds the inner beauty, light, bliss and energy of the most enigmatic of the great Goddesses. The book consists of wonderful stories, direct encounters with the Goddess and profound wisdom on the cosmic and transcendent reality. It outlines the deeper philosophical meaning of Kali as the supreme Goddess of Yoga, her mantras and rituals, and how she appears to sincere devotees today. It is a sequel to Shambhavi’s Yogini and shows her further unfoldment and teachings.